Looking for some advice, I’m having a small wall built with a patio on the side of the hiuse. 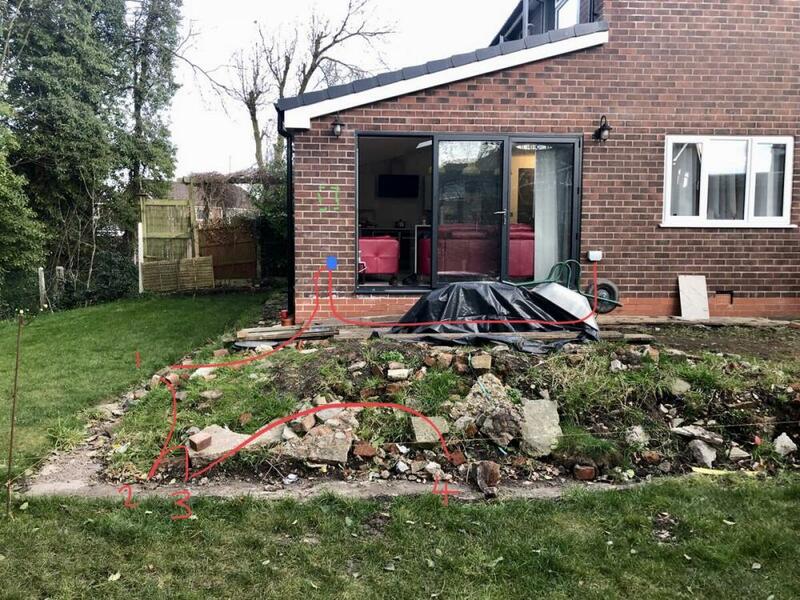 Without getting an electrician in now is it possible to get some cables put into the ground/walls for an electrician to sort later? If I’m choosing brick type lights, brick or wants one up front so he can work out how to accommodate. @daiking Unless there is a show stopper I would go with something as close as possible to the right place already. They will presumably be LEDs so no significant load from the lights, though you may want to consider an external socket on the patio wall too ? 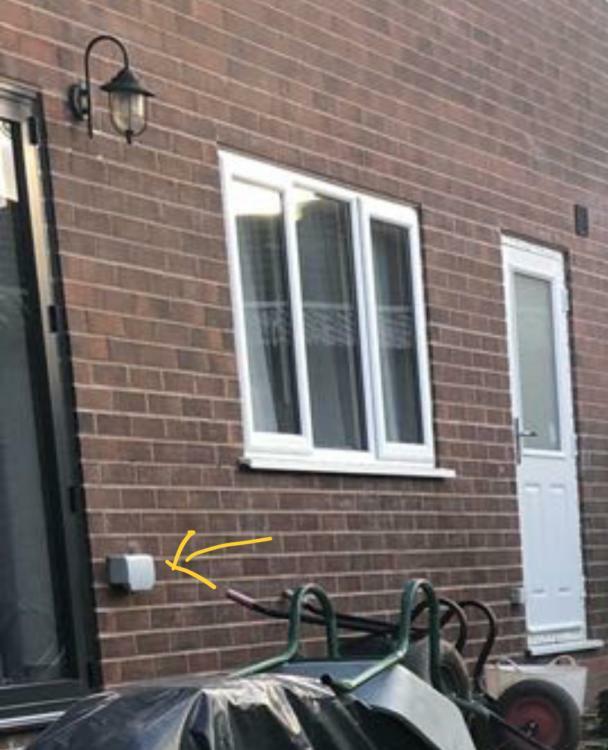 I am not sure what stance a lecky would take wrt to certification with a cable he has not seen installed underground, without appropriate evidence or supervising the install. Could the correct type of isolation via a master switch internally or water-certified external junction box put it outside the scope? One way I deal with Ts wanting external power is to supply a proper outside double socket by a professional electrician with an internal master switch, FCU or separate circuit from the CU, and leave them to do what they will outside. PS Plan B Fit a duct / drawstring and let the electrician pull his cable through. CHave you picked the lights yet? Loop in, loop out to the light itself - not always practical if a small light. Loop in, loop out to a suitable junction box. Last time I got involved in any garden lighting used these Pratley boxes at the base of the fence posts the lights were going on then ran up the post to each light fitting. If you dig a trench (450mm good) and lay your own cable then be sure to photograph with a tape down the trench to prove the depth. Edit: Used Wago blocks inside the junction boxes. Could you (you could)...work it out so your lights are above a slab position. Put the jb slap bang centre under a slab along the edge. Run the swa from the jb up behind the wall where the light is going. Some say it's ok to go shallower with cable if under slabs. The downside is if someone later decides to drill for a rotary clothes line or bolt down some pergola brackets. The wall is 4m from the house so proximity to exisitng is moot. haven’t picked any lights yet, also looking for anyone’s experience. Suppose some thing surface mount is easier but built in might look the part. Btw these lights will be in the wall facing the grass below the patio , absolutely no use for lighting the patio. Exisitng lights for that. exactly issues with cable. Wall will have in fill, a load of MOT and slabs laid in full mortar bed. Will need to drill in to top for handrail thing. As it’s lights then hoping a small swa cable would do and placate any location concerns below the slabs. Running cable between proposed light positions and back to a supply. We have just bought some LED duel solar & battery lights from Costco. Stainless steel, really smart looking & well made. No wiring required. Thanks but I don’t think solar would be very good here, low down on a north facing wall. So how many cables would that need? 2 to each location? From wherever I’m starting out? 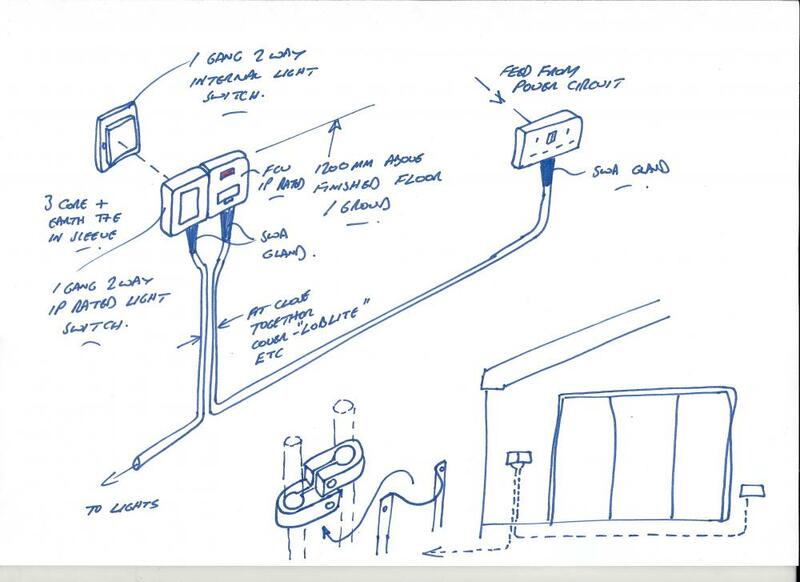 would you tap into an existing indoor light circuit or power circuit? or should I think about wiring it to the outdoor circuit in the future that doesn’t exist yet? You ideally want the outside lights on a normal light switch, indoors, at a normal height. Handy if this can be next to say where you can look out onto the lit area as in hear a noise at night, stand next to the "kitchen" window or wherever and illuminate the scumbags trying to nick your gnomes! You can get flash and make this a two way switch with a second IP rated switch outside - it's getting dark and your on the patio - you don't have to traipse into the house to put the lights on. You can come off an existing lighting circuit or a power circuit if you fuse it down. You can have the garden lighting on it's own rcbo back at the board. Anything getting damp / wet won't affect the other lights etc. Have a look at this install manual for instance. Really you want to select your brick lights first. Some come glanded others you have to drill and gland to suit. You can daisy chain or feed a terminal box then individually feed each lamp from that. Well I am looking for prompts/recommendations on lights. Those saxbys are £30-40 min. Thought you liked really cheap? If these new lights come of the existing wall lights switch that would be great, led so power consumption is minimal. whats the Knightsbridge stuff from TLC like? “The mark of quality”, lol, is not normally a good sign. Someone's seen £7.99ea / only 8 left methinks! They take replaceable PL lamps whereas with a lot of LED stuff you need to bin the whole fitting. You have to buy the lamp on top but still only adds a couple of quid. BUT ONLY IP44 so no! As for your Eddies link...expensive! K'bridge outside lights don't get glowing reviews tbh. The Eddies ones and probably the link I put up if the same lights allow cable in /cable out. So two cables to each lamp except the last in line of course. You could drop in some 20mm flexible conduit for now. 20mm? At last, something I already wasted my money on in the past so I don’t need to buy more stuff. I’m hoping that 1.5mm swa cable is ok as it’s lighting. Sheeeeeet, brickie starts on Wednesday (in time for a cold snap ). Why not run some 20mm duct, 2 to each position and get the brickie to leave a brick out in that location. 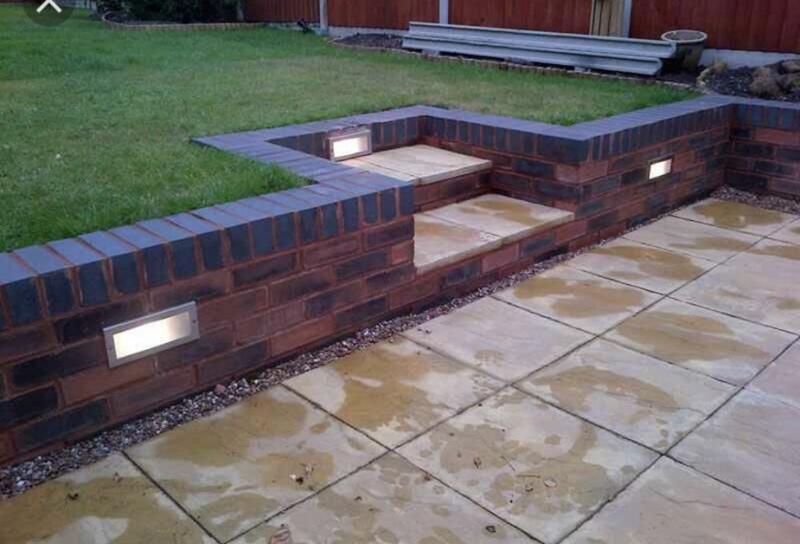 Tbh you could cut brick sized chunks of PIR or eps for him to lay & dig out later when you fit your brick lights. You don't even have to run a full length from the connection point at the house. Start it just before where the walling starts. Join it later. Well... I’m not too sure I want to draw too much attention to this ‘feature’ now. It’s a bit bigger than I imagined. Hence the further indecision. Beware going to a light switch to get a feed as normally they won't have a neutral in there . Open it up and double check first. Didn't you say you have an external power supply ? If so use that for the feed, and if you want to be flash, do as @Onoff suggested and run a 3-core and earth ( 4-core 1.5mm2 SWA ) to the nearest internal light switch. Then you can switch it on / off from inside or out. Give the cable tobthe bricky and explain where you need it to / from? If he's half intelligent of course . Yes, this is the plastic outdoors box (off indoor power circuit) plus you can see the (one of two) existing outside lights (off indoor light circuit). can you terminate SWA to a socket box like that or will that need a different box too? Should have circular knock outs on side / top / bottom etc specifically for a 20mm Swa gland . So that would also need to be wired to an ugly outdoor switch? but 4core would mean I could also have a switch inside? Youll need one cable that powers the lights, live neutral and earth. From any junction you then create your switching circuit. Live to the 2-way switch Common terminal and L1 ofcthe switch goes to the lights as the "switched live" feed. From that switch you then need a 3-core and earth as a 'strapper' between that switch and the second switch. I'll add the configuration later but that's what you need to know for cables . That plastic "outdoor box" - is it two double sockets in there or just a terminal box ready for "something? Im not intending to DIY, . Just want to know where to take things to. To be honest I’d prefer the switch on the left (blue box) as that is the opening side of the bifolds and the green outline is where the outside lights are switched internally. So cable from sockets to blue box (switch) then cable to wherever I decide that I want lights. IP66 double socket. Now I’ve looked at it, it has many knockout ports. The only thing I'd add is that there may be a conflict of supplies in the internal switch if that's got the existing lighting feed in it, and then you take the outside live into it too. @Onoff / @ProDave, any issue with the two feeds sharing the same switch plate ? If not, then if the existing internal switch is a single or double, it can be bumped up to a double or triple ( 2 gang or 3 gang ) rather than make a new cut out for an additional switch to add the extra gang. Getting from the blue square to the green square can be done by fishing the cable down the cavity. Push some slack back on the cable, into the cavity, to get a drip loop.